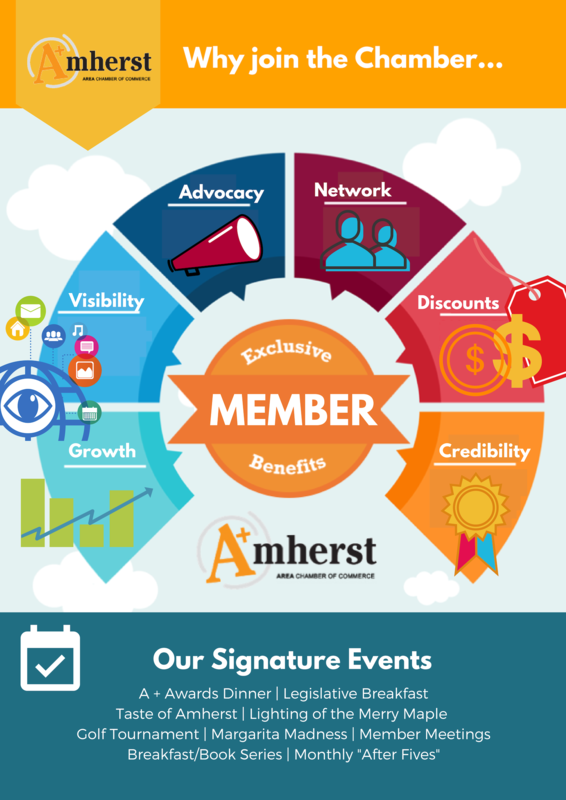 The mission of the Amherst Area Chamber of Commerce is to create, maintain, and promote a vital, thriving business climate throughout the Amherst area and to initiate and support the civic, educational, recreational, and economic well being of the Amherst Area. To join or to learn more, call Executive Director Claudia Pazmany at 413-253-0700. Annual advertising in Pioneer Valley Visitors’ Guide—(125,000 distributed throughout the Northeast and USA) and shared on partner Chamber websites in Northampton and Easthampton. Complimentary rack space at the Visitors Information Center. Complimentary rack space at the UMass Mullin Center. Relocating or just opened your business? The chamber offers Ribbon Cutting Ceremony services Mon-Fri. We invite all chamber board members, ambassadors, and members of the chamber. We also include the ribbon, scissors, and pictures in the chamber member mentions e-newsletter and the Daily Hampshire Gazette. As a member-only referral organization, the Chamber drives business directly to Chamber members. The Chamber office & website receive hundreds of inquiries each month.